As you can see from the figure a GridView control displays a list of files that can be downloaded. 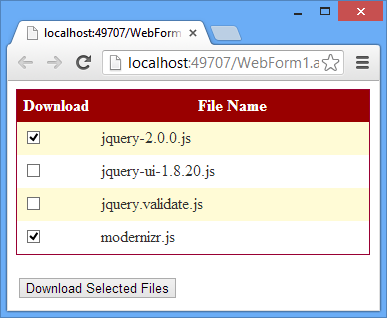 A user can select desired files using checkboxes shown in the first column of the GridView and then click on Download button. In the click event handler of the Download button you need to zip the selected files together and send a single ZIP file to the user for download. If you wish to display additional information about a file such as size and timestamp you can add additional properties to the DownloadableFile class. Now, write the following code in the Click event handler of the Download button. The above code basically creates a ZipArchive and adds files to it based on user selection. User selection is obtained by iterating through the Rows collection of GridView. Once the user selection is known you can easily add those files to a ZipArchive using CreateEntryFromFile() method. Once the ZIP file is created, the next step is to send it to the user so that the user is prompted to download and save the file. The code marked in bold letters does that job. That's it! Run the web form and test if it works as expected.